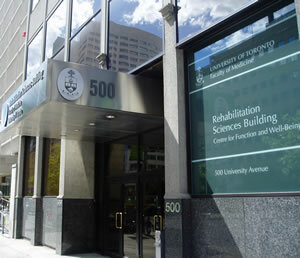 The Department of Occupational Science and Occupational Therapy is located in the University of Toronto’s Rehabilitation Sciences building on the 9th floor of 500 University Ave. We are located a few blocks south of St. George campus near the corner of Dundas St. and University Ave.
We are easily accessible via public transit (TTC subway station is St. Patrick Stn). Parking is available in public lots or metered street parking in the vicinity. 160 – 500 University Ave. Please contact ot.chair@utoronto.ca if you notice broken links, display problems, or any other technical difficulties with the website.